A lovely walk around Malham Cove and Ing Scar. Only a couple of minutes into the walk and I'm starting to gain some height. This is the view looking south in the direction of Gargrave. Looking across the dry stone walls to Cross Field Knotts. Malham Cove comes into view. Zooming in on Malham Cove. A view over the hills to Great Knott and Weets Top. The path to Dean Moor. This path takes you around Malham Cove and offers amazing views the whole way. A superb view from this quiet path. A panorama from the route to Dean Moor. Click for larger version. Layers of hills and countryside with hoardes of people heading for the Cove. I saw no walkers along my route until I reached Ing Scar, compare that to the main path! Comb Hill at the top of Ing Scar. Thats Lang Scar on the left and Dean Scar on the right. Now at the top of Ing Scar looking up the Pennine Way to some caves. A Pennine Way Panorama. Click for larger version. 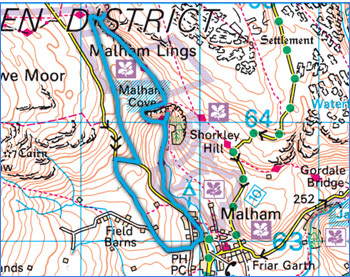 The remainder of the route to Malham Cove which is also the route of the Pennine Way. In my opinion this has to be one of the best views on the walk! Looking up to old caves. Following the valley floor to Malham Cove. A view back to dramatic cliffs and crags. And a view of Malham Cove from the top. A panorama from the top of Malham Cove. Click for larger version. Lots of people still coming and going along the main path. The famous limestone pavement on top of Malham Cove. And a final photo from the bottom looking up.